LKQ posted organic North American revenue parts and services growth of 5.2 percent in the third quarter despite a scant increase in collision and liability claims, CEO Nick Zarcone told investors last month. Citing CCC data for the U.S., Zarcone reported that collision/liability combined metrics only rose 0.3 percent in the third quarter and 0.4 percent for the first nine months of 2018. Globally, LKQ’s parts and service organic growth rose 4 percent. Zarcone said few companies in LKQ’s space had that kind of growth. “We had a very solid third quarter,” Zarcone said at the start of the earnings call. Zarcone attributed LKQ’s “significant outperformance” compared to the U.S. frequency trend to the company’s growing market share and more cars in the collision “sweet spot” of 3-10 years old. LKQ’s aftermarket parts organic growth continued to outpace its recycled parts growth, as North American shops “focus on improving cycle times given the increased volume of work they were processing,” Zarcone said. Given that frequency rose so little nationally, it’s an interesting observation. 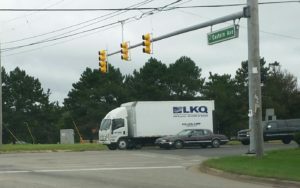 It seems to suggest collision repairers using LKQ’s aftermarket parts are gaining market share over the ones who don’t. Zarcone said “importantly,” LKQ has increased its total aftermarket collision SKUs by 5.7 percent and its certified aftermarket inventory by 11.2 percent over the third quarter of 2017. He estimated the company’s North American aftermarket business is somewhere around a $3.5 billion interest. LKQ’s growth came despite its “solid progress” in the third quarter globally on improving its margins, according to Zarcone. North American margins fell slightly to 43.2 percent, but Zarcone said this was a function of falling scrap prices affecting its self-serve business. Throw out that data point — which is out of LKQ’s control — and margins actually rose during the quarter, he said. Chief Financial Officer Varun Laroyia said that gross margins on LKQ’s North American wholesale actually contributed 0.6 percentage points of growth, tied to “active margin managment and pricing refinements.” The company’s North American wholesale margins also rose by 0.7 percentage points over the second quarter of this year. Zarcone said his North American team was disciplined on pricing, discounts, and improving margins through LKQ’s telematics and Roadnet capablities. He said the company felt its balance sheet would continue to face inflationary pressures (he cited salaries, gas prices and overall inflation specifically while discussing the third quarter), but more margin improvement strategies existed. “We are not done,” he said. Laroyia also said the company had more work to do to respond to expenses. “The team continues to push hard (on margin),” he said. This could mean repairers and insurers will be out of luck in terms of seeing shop discounts grow or part prices fall. In fact, Laroyia said he was encouraged that the company grew margins sequentially but still produced “solid” organic growth. Zarcone said he felt organic growth would fall in the fourth quarter, primarily because the company was “absolutely focused” on keeping good margins for every incremental revenue generator. “We do not want to chase low-margin business down the rabbit hole, because at the end of the day, that doesn’t do us any good,” Zarcone said. The easiest way to drive revenue is to “drop your prices,” and given LKQ’s market share, competitors’ primary strategy would be price cuts. “We’re being very disciplined not to do that,” he said. While “short-term disruption” might occur, Laroyia said LKQ felt customers would see the benefit of buying from LKQ and its customer service, national distribution and large inventory. In terms of LKQ’s ability to raise prices in the North America and the elasticity of demand for its products versus OEM parts, Laroyia said the company has seen the “stickability” of prices, which is reflected in its results. Asked if upcoming frequency and severity trends didn’t concern him because LKQ was pursing higher-margin business, Zarcone agreed. Zarcone said the company’s expectation is that its fourth quarter margins will be under 2017’s, but 2019 provides easier year-over-year metrics, and LKQ thought it was “getting close” to posting overall margin growth.